This is the first of three books that the late geologist Kenneth S. Deffeyes, who passed away a year ago this week, wrote about the coming global oil crisis. The goal of these books is to provide readers a rudimentary understanding of oil, where it came from and what's involved in finding and producing it, in order to raise awareness about the peril we face as oil depletes. All three books deftly achieve this aim courtesy of Deffeyes' expertise, his gift for communicating science information and his great wit. Part of what makes the books so accessible is that they're almost as much autobiographies as textbooks, allowing us to get to know their author personally. Chapter one of Hubbert's Peak tells of how Deffeyes' career began at the prestigious Shell Oil research lab in Houston, Texas, in 1958. An oilman through and through, he felt at home in the field; but while at Shell, he met someone whose research persuaded him that the U.S. oil industry didn't have long to live. The person in question was Marion King Hubbert, a preeminent geoscientist who today is best known for his theory of peak oil. In 1956 Hubbert accurately predicted that U.S. conventional oil production would peak between 1965 and 1970, then begin an irreversible decline. Based on Hubbert's numbers, Deffeyes concluded that the U.S. oil industry would shrink drastically in coming decades. So, in the late 1960s, he decided to leave the oil business and become a geology professor at Princeton University. In 1997, after teaching there for 30 years, he retired, became an emeritus professor and commenced writing his books about oil. By that time, Hubbert, who had become a close friend of Deffeyes', had long since passed away. Drawing on Hubbert's notes and equations, in 2001 Deffeyes predicted that oil production for the entire world would soon peak and begin a permanent decline. At the outset of Hubbert's Peak, he posits a date range of 2004 to 2008 and argues that once the global peak is reached, our civilization will become mired in a crisis such as it has never before seen. The first thing to be said about this book is that the prediction made in its opening pages turned out to be wrong in a big way. While global conventional oil production did indeed peak around 2005, the oil shortage has yet to materialize, thanks to an unexpected boom in U.S. unconventional oil that began 10 years ago. Even so, the gist of our predicament remains the same: Oil is a finite substance created by rare geologic circumstances, and all other energy sources now available to humankind fall far short of it in terms of energy density, transportability, versatility and storability. 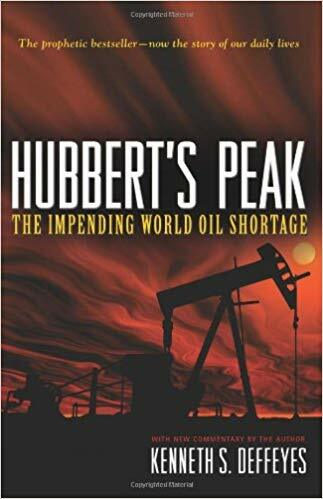 Moreover, Hubbert's Peak is still remarkably up-to-date when it comes to a number of other topics it covers, including our understanding of oil's origin, the myriad uses to which our society puts it and the shortcomings of its putative replacements. True to his goal of reaching a wide audience, Deffeyes takes pains not to make this book too technical. He delves a bit into organic chemistry, but wisely refrains from including any chemical formulas in the text, instead relying on figures and brief accompanying captions. He also details the mathematics underpinning Hubbert's ideas, but rightly opts to relegate the equations to endnotes. The parts of Hubbert's Peak that deal with finding and developing oil resources offer, among other things, a fascinating glimpse into a day in the life of a petroleum geologist. Ninety-five percent of that day, says Deffeyes, is devoted to searching for petroleum traps. These are subsurface rock formations that block the movement of oil and gas, allowing these fluids to accumulate in reservoirs from which they can be recovered. Detecting a trap requires knowledge of the types of rock present and the temperature history of any potential oil source rock (i.e., rock with the ability to generate oil). But even with our current knowledge of such things, petroleum geologists have a tough go of it. "There is a spectrum of things that can go wrong," writes Deffeyes, "from big conceptual errors to small detailed mistakes. All of them are fatal." Understanding how petroleum geologists determine whether a potential oil source rock contains oil requires knowing some basics about organic chemistry and the chemical reaction that cracks source rock into oil. To this end, Deffeyes describes the molecular cracking process and provides a sort of condensed field guide to the types of molecules found in crude oil. He keeps this chapter brief and, as noted earlier, doesn't dive too deeply into the chemistry. Another way he lightens the material is by injecting his trademark droll humor. At one point he likens the catalysts used in oil refineries to divorce lawyers, since their molecules manage to remain intact even as they enable innumerable oil molecules around them to split apart. He drops another funny line while remarking on pollen's ability to stay preserved in sedimentary rock over millions of years: "My congratulations to the plants; hay fever is forever." For those who enjoy learning how things work, the chapters on technologies and methods used to discover and produce oil are a riveting read. Topics covered include subsurface geology mapping, reflection seismology, drilling rig equipment, drill bit types, oil well completion, hydrofracking and horizontal drilling. The material on these latter two is admittedly dated. Deffeyes treats hydrofracking and horizontal drilling as mere asides and makes clear that he doesn't see them holding much promise. Yet in the years since this book's release, these technologies have been instrumental in bringing about the recent surge in unconventional fuels production (predominantly in the form of fracked oil from U.S. shale formations) that has staved off the global oil shortage. Still, it's hard to fault Deffeyes for this oversight, since the shale oil revolution has truly been one of the great surprise developments of recent history. In addition to presenting hard science, Deffeyes also goes into the soft science of economics. He explains how geologists and economists approach the challenge of oil discovery from fundamentally different perspectives. Economists insist that the amount of money invested dictates one's success in finding oil, whereas geologists maintain that no amount of money can grow the supply of a finite substance. Deffeyes is critical of both viewpoints, stating that each is only partly right. He says economists are correct insofar as investing zero money yields no new oil. On the other hand, geologists know that while hurriedly investing large sums of money might get more holes drilled, many of these will be dry holes. Deffeyes goes on to show how Hubbert's numerical methods can be used to estimate future oil supplies "independent of an economic or a geologic bias." The book's assessment of alternative energy sources remains right on the mark. The energy sources that Deffeyes considers–geothermal, hydroelectric, solar, wind and nuclear–continue to be plagued by the problems identified in this book. The chief limitation for geothermal is the dearth of high-grade heat sources capable of producing power economically. The problem with hydroelectric is that most of the favorable sites have already been tapped. Solar and wind are hampered by issues of intermittency and poor energy density. Nuclear energy is the one alternative that Deffeyes sees having significant potential to help mitigate the depletion of oil, though he acknowledges that the threats of radioactive contamination and nuclear proliferation are troubling downsides. It's a bit curious that Deffeyes' analysis omits biofuels and biomass, whose dismal energy returns would serve to strengthen his argument that alternatives lack the energy concentration needed to replace oil. Ethanol, biodiesel, biogas and solid biofuel were all part of the alternative energy picture back in 2001 (even if they weren't yet the craze they would later become), and as such should have received at least a mention here. Deffeyes says he keeps an open mind about new proposed alternatives. "It takes real judgment to sort the sheep from the goats," he writes. "It is all too easy to say, 'It won't work.'" Instead of pre-judging each new proposal, Deffeyes contends that we need to encourage open competition in order to generate detailed ideas on project implementation and identify potential design flaws. However, he cautions that we should be wary of anyone who claims to have a single solution to all of America's energy needs. The reality is that different energy sources are suited to filling different parts of the puzzle. And he warns that we should be equally suspicious of those who offer a dizzying array of alternatives, since these individuals would have us believe that the vast number of energy sources available to us means there's nothing to worry about. While energy efficiency is important, Deffeyes counsels the need to be on guard for false efficiencies. For example, great gains have been made in automobile fuel efficiency, but when these require additional energy to be burned at refineries in order to meet new specifications for gasoline and diesel fuel, they can become self-defeating. "We need to look at the whole system," writes Deffeyes, "including the refinery and the car manufacturer, when we 'improve' the system." The disclaimer at the beginning of Hubbert's Peak couldn't be more prescient. "Although the author has made a good faith effort to evaluate the likely future course of the industry," it reads, "circumstances may change and the author may have overlooked something that will turn out to be important later." Of course, Deffeyes, like most everyone else, did miss something significant in his analysis that caused his prediction on the exact timing of the oil crisis to be incorrect. Still, I give him credit for acknowledging in advance that he might not be right about all the details of the picture he was painting. He was certainly right about the basic dimensions.